George Lines' 15cc Sparky motor spawned dozens of clones in the late 40s and early 50s, including this one, built by the late Stan Poyser. The original version had adjustable compression, but Stan's also had adjustable rotary disc timing, achieved by rotating the back plate. A serious seizure and attempts to get the motor apart accounts for the obvious damage to the cylinder. Happily, a new liner, with its myriad of drilled and milled ports, and a new piston have been fitted as part of the ongoing restoration of what is possibly the only complete example of a 15cc boat from this era. See this month's hydroplane 'Pitbox'. Two hand built 10cc tethered car motors brought to recent club meetings in Sydney. They were both built by the late Alf Lee, a toolmaker and long time competitor. Number 1 on the left shows distinct influence from the Hornet bulge bypass with its separate cylinder barrel. The later number 5 on the right has moved to a monobloc casting. Australia and New Zealand are both notable for the remarkable number of superb racing motors that were constructed when imports were not available. Basil was well known for his 'Black Magic' and the amazing supercharged 'Barracuda' hydro motors, but then became involved in designing small commercial diesels. 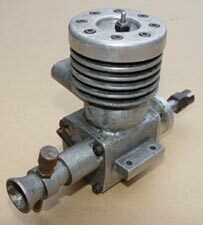 As well as the Miles 5s and 10s he also produced distinctive 15cc and 30cc water cooled glow motors. This 30 though would seem to date from the early 50s when several similar motors were being produced for hydroplane work. None have quite such a small crankcase or pronounced big end 'bulge'. If anyone is aware of the location of either of Basil's hydro motors, post Gildings, we would love to know so that they could be photographed, with a view to exploring his career in tethered cars and hydroplanes further. D class racing was usually the province of the ETA 29, but this Dooling that appeared on eBay had a serious session in the workshops of both Dickie Phillips and Tom Dalziel. 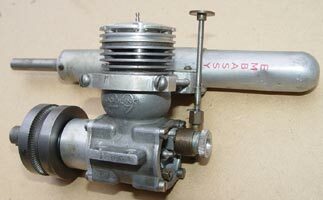 New front housing, cylinder head and peripheral jet venturi all topped off with the wonderful cigar tube silencer. It is not known if this motor has ever run in a boat, but should a suitable vintage hull become available, then it could yet see the water. 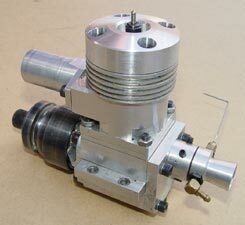 Another motor built entirely from bar stock material by Ernie Hills, but this time a 15cc 'B' Class motor. With a view to supporting this British class, Ernie kindly passed the motor and hull on to a current competitor so that it could be run again. During the 2010 season it suffered a number of mechanical maladies remedied each time by the kind offices of Ron Hankins. Not only is the engine a fine piece of engineering, but the sheaf of CAD drawings that came with it are a wonderful contrast to the pencil drawings and blueprints of the past. A very rare engine indeed. Since the virtual takeover of the 10cc class by commercial motors there have been very few people that have taken up the challenge of competing with a motor of their own. A set of photos from Jim Free led us to discover one of these rare beauties by something of a roundabout route. 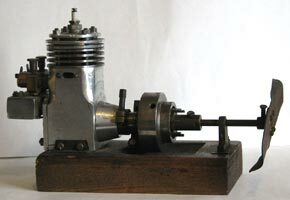 Not only did Ernest Hills machine this motor from bar stock, but also completed a 15cc 'B' Class version, which is what we were actually on the trail of. 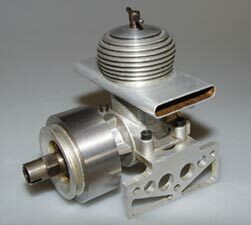 What makes this motor so unusual is that it is only the second 10cc motor we have discovered machined from the solid, rather than castings. As a direct result of contacting the vendor of this motor, we were able to unravel another wonderful tale of coincidence (and luck) that makes running OTW so gratifying. Purely by chance, this is one of those 'A' Class motors mentioned below that never got finished. It was built by Brian Jones of the Bournville Club from castings and drawings by Ken Williams, builder of the then outright record holder 'Faro'. For further details of this engine and the remarkable chain of events that brought it to our attention we have added an update to the 'Faro' file. 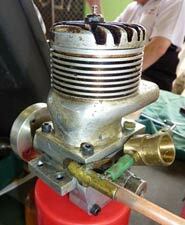 The 30cc four-stroke engine held the outright hydroplane record from 1936 to 1949 when the high performance two-stroke killed development of these motors stone dead, leaving some projects stillborn. These part finished castings appear to be the work of Ernie Clark from the Victoria Club, probably intended for Gordon 2 before he made the decision to change to two-stroke power. Whether the angled ports were an attempt to improve gas flow is not known, but he seemed to be the only person to use this configuration. 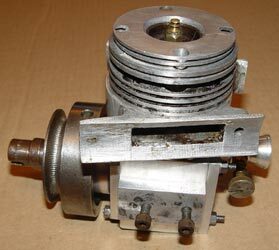 Development of the four-stroke single continued in motorcycles for some while and it would have been interesting to see some of these ideas incorporated into a hydro motor, but its day had passed. 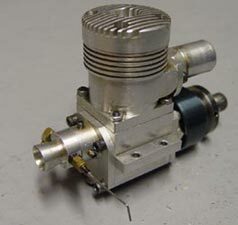 If this motor looks similar to the one featured in Jun 2010, it is because it was built by the same person, to the same design, but reduced in size from 30cc to 10cc. 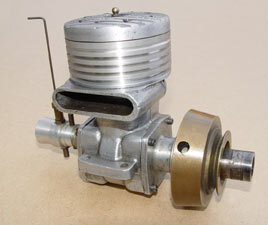 Home built hydro motors in the late 40s and early 50s were usually copies of either the McCoy, or in this case, modelled on the Dooling. The obvious feature is the rounded bypass or transfer on the Dooling clones as opposed to the flat passage on the McCoys. 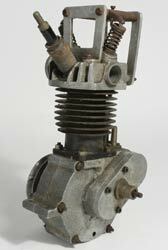 This motor was built by the late John Scarnell, who raced with the Fleetwood Club from the early 1930s. 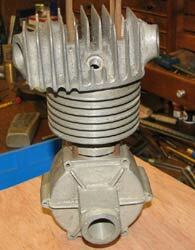 Like its bigger brother, this motor also appeared on ebay and happily now sits next to the larger version. 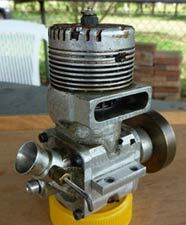 A while ago a collection of engines was offered for sale that seemed to confirm a link between long time tethered car, hydroplane, rail car and engine builder extraordinaire Arthur Weaver and the AMCO concern. Geography and time indicated that this was after Ted Martin's involvement, but where did Arthur fit in? This AMCO 3.5 based hydro motor is obviously the work of Weaver as the hole spacing in the engine mounts are identical to those in his Wizard of Oz boat. At present, this whole aspect of Weaver's life is part of an ongoing research project, but for a taster go to this month's Weaver 'Pitbox Special'. This was the nickname for the AMCO 3.5 that was renowned for doing so much damage before the arrival of the 'chicken stick'. This mystery spark ignition motor seems to have the blade from a commercial strimmer attached to the drive shaft? The motor is interesting in having two parallel venturis with two needle valves and two stranglers fed from a common tank. Obviously home built for a car or boat, but who fitted the blade and why. We will never know, but a wonderful piece of whimsy.